This is a broadly chronological account of the decorative and innovative use of Portland cement-based concrete. Contrary to the oft-held belief that concrete is a dull material that is used unimaginatively, this book demonstrates that it can be used in an exciting and inspiring way while benefiting from being a highly durable building material. After tracing the decorative use of concrete back several thousand years, its development is followed into the 20th century with the invention of Portland cement and its subsequent use in vast volumes. As concrete was used more widely, it also was used more creatively and accounts are included of some of the early exponents of the material such as Frank Lloyd Wright, Le Corbusier, Nervi, Lubetkin and Arup. The brilliance of these and other designers and engineers has provided a legacy of economy and form that is akin to today's current vogue of minimalism. The variety of scale and form is remarkable and after considering decorative processes and techniques, the book moves into the sphere of art, demonstrating the flexibility of the material. The book contains a wealth of illustrations, and in the later chapters the author considers the work of selected designers and then presents a large number of examples from around the world. The final chapter looks ahead, taking in current developments in high strength concrete that allow thin, slender applications, also novel self-cleaning concrete and even transparent concrete! 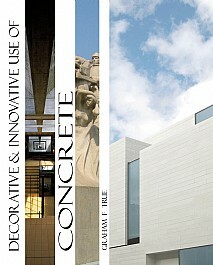 Of one thing we can be certain - concrete is not dull! This handsome large-format book will appeal to architects, designers and engineers whether in practice, academia or research and students in architecture, design and civil engineering.